They’d all be here in 15 minutes, my mom alerted me in a text message. My mom and dad, grandma, uncle, and contingent of cousins were on their way, the first arrivals of a 21-person Thanksgiving feast. I reflected on the progress, what still needed to be done, and felt a sense of calm. The tables were set, the turkeys in the oven and rotisserie, the soup simmering on the stove. Despite a short period of feeling pressured to get everything done a half an hour prior, my husband and I were ready to welcome the first of our first guests. We’ve hosted feasts in the past–large groups of so many people that we’ve made big batches of chili or ribs and let our guests serve themselves with paper plates and plastic cups. But being our first sit-down meal with more than about 15 people, this event required quite a bit of extra preparation. So off I headed to Ikea for a ridiculous amount of plates, utensils, water glasses, and wine glasses (and a necessary serving of Swedish meatballs in their cafe), and I braved the pre-Thanksgiving holiday rush at the mall to find linens. And then there was the food. Last Sunday I realized that I could minimize my time at the grocery store–guaranteed to be crowded any time in the following days–by ordering most of my groceries online. By the time Tuesday rolled around, I told the women in my Bible study that I was feeling strangely relaxed about hosting such a feast–perhaps that was cause for concern? But before I knew it my house was full of relatives from both sides of my husband’s and my family, who were happily mingling and sampling from bottles of bottles of Beaujolais Nouveau, Côtes du Rhône, Grenache, and Tempranillo. Soon the dining room was full of relatives hungrily eating a first course of butternut squash and chipotle soup garnished with cocoa-toasted pumpkin seeds and served with aged-cheddar biscuits. While the bowls were emptying, my husband carved the turkeys and the side dishes were passed: Mom’s sweet potatoes in orange cups and her classic sausage dressing, my mother-in-law’s creamy mashed potato casserole, a perfectly sweet-tart cranberry sauce from my sister-in-law, and a squash and radicchio salad from my brother-in-law. The calm I had felt in the days leading up to the event had not been the calm before the proverbial storm, but rather a sense of peace and confidence that everything was under control, that the day would turn out to be what it should be: a time to spend with loved ones and to reflect on all the things we have to be thankful for. A few days ago I even managed to bake a batch of cookies–not for Thanksgiving, but just for fun. I had seen a recipe for cardamom thumbprint cookies in Food & Wine and wanted to give it a try, adding lingonberry preserves to the mix for an extra-Scandinavian touch. We certainly didn’t need any more sweets–we had more pies, cakes, and cookies than we could eat–but baking these amidst all of the holiday preparations gave me a chance to do a little something for myself and it also resulted in being able to send home a box of treats with some family members last night. With Thanksgiving in the past and the countdown to Christmas now here, I’d like to share with you the first in a series of cookie recipes I’ll be featuring on Outside Oslo in the coming weeks. Whether your Christmas preparations include making the traditional syv slags kaker–seven sorts of Norwegian Christmas cookies–or perhaps making just a few batches of favorite family cookies, I hope you’ll find ideas and inspiration here on the blog. I’m aiming to share seven cookie recipes in the weeks to come, but even though I’ve read that it wouldn’t be a proper Norwegian Christmas without at least seven types, I’m modifying the tradition for my family and choosing to do as many–and only as many–as we can make while still maximizing a sense of togetherness, fun, and holiday cheer. Whether that ends up being three, four, seven, or ten types, I’ll be happy with the results. I hope that you all had a good Thanksgiving and that you have a blessed holiday season. Preheat oven to 350 degrees F and prepare two baking sheets by lining them with parchment paper or using a Silpat baking mat (I did the latter and baked the cookies in rounds batches). Whisk almond flour, all-purpose flour, cardamom, and salt together in a medium bowl to combine. In a medium-to-large bowl, beat the butter and sugar using an electric mixer for about three minutes, until it becomes light and fluffy; scrape down the sides of the bowl as necessary to fully incorporate the ingredients. Beat in the egg and vanilla extracts, then turn down the speed to low and mix in the dry ingredients, just until incorporated. Turn out the dough onto your work surface and knead it a few times, forming it into a ball. Shape the dough into little balls using a tablespoon measure and arrange them on the baking sheets about an inch apart. Make an indentation in the center of each–Food & Wine suggests using a teaspoon for this–and bake until slightly firm, about 10 minutes. Reinforce the indentation in each cookie one more time and return the cookies to the oven until they start to turn lightly golden and feel dry to the touch. This should take about seven more minutes. Immediately transfer the cookies to a rack. 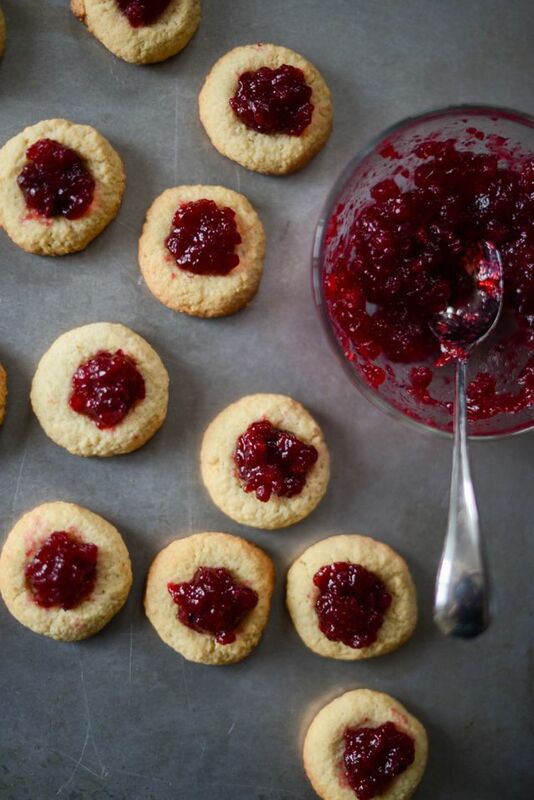 When completely cool, stir the lingonberry preserves in a small bowl to create a smoother jam (it’s okay to leave the berries intact), then carefully spoon a little into the center of each cookie. I absolutely love the smell of cardamom. These look easy enough to make. I will have to try them. Hope you had a nice Thanksgiving Daytona! Thanks, Debbie. It was a very nice Thanksgiving. I hope yours was as well. I agree–cardamom is one of the most pleasant and comforting scents. MMmmm… I need to find some lingonberry so I can try these! Sounds like a lovely Thanksgiving! Sarah, I hope you do! i love jam thumbprints. lingonberry sounds great! The lingonberry goes great with the cardamom in the dough. Someone on the Facebook page suggested cloudberry preserves, too, which would be delicious. Oh I love these! I am from Puerto Rico and these are a staple of our Christmas table. Not sure if you have checked out Stonewall Kitchen’s Holiday Jam. It is delicious and takes thumbprint cookies from delicious to amazing! Can you substitute the almond flour for regular flour? There may be some people with nut allergies where I’m making these for. Olivia, that’s a great question. I haven’t tried it, so I don’t know the results would change. How long will these cookies stay fresh & is refrigeration advised? Can they be made in advance is a better question? You are so lovely! ~ inside and out! Your writing is wonderfully uplifting too!! most importantly they helped with “flow” & saved time, which is energy! So as a little holiday gift to all your readers. here are my tips ~ enjoy! actually that you can do sitting instead of standing as it save energy. You will feel more rested at the end of the job and you will enjoy it more!! This saves time and children can help with the log rolling and slicing with a butter knife etc. (This same method is used for making gnocchi). going into each ball about 2/3rds of the way down to make a hole for the jam. * * I love that you add the jam last and don’t bake it! then before it was baked. I also found an alternate method of making ball cookies. filling them with a jam filled pastry tube after the cookies had cooled. * A fluted edged round cookie cutter makes them look nice & like a flower, too! add a dab of butter to your rolling pin. like more flour will sometimes or change the delicate texture of your cookie. * This butter tip is great for rolling out breads doughs, rolls scones, etc. too! This last “rolling method” saved me a lot of time making cookies! Well, I am off to get the ingredients to make your cardamom cookies!